Silver tumbled 4.4% this week. Gold shed 0.8%. 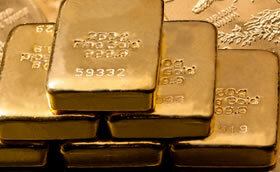 Gold futures moved higher on Friday but they still posted their seventh weekly loss in eight weeks. Silver, meanwhile, dropped to a near 6.3-year low. Gold for February delivery rose $3.70, or 0.3%, to settle at $1,075.70 an ounce on the Comex division of the New York Mercantile Exchange. "The euro/U.S. dollar bounce and 10-year U.S. Treasuries easing today have helped lift gold prices, and trump the weakness in oil and expectations for a rate hike next week," Reuters quoted Suki Cooper, precious metals analyst for Standard Chartered Bank in New York. Gold prices lost 0.8% on the week after rallying last week by 2.6%. They are down 9.2% from their final 2014 settlement price of $1,184.10 an ounce. Although sentiment among market professionals has also fallen compared to the last survey, a majority still see higher prices in the short term. Out of 36 market experts contacted, 18 responded, of which nine, or 50%, said they expect to see higher prices next week. At the same time, five analysts, or 33%, expect to see lower prices, and three people, or 17%, are neutral." Elsewhere, silver for March delivery fell 22.6 cents, or 1.6%, to close at $13.884 an ounce. The settlement was the lowest since Aug. 20, 2009 when the precious metal ended at $13.876 an ounce. Silver prices tumbled 4.4% on the week and they are down 11% on the year. January platinum declined $12.20, or 1.4%, to $843.70 an ounce, falling 4.2% from a week ago. Palladium for March delivery added $2.55, or 0.5%, to $544.80 an ounce, but lost 3.9% on the week. For the year to date, platinum has plummeted 30.2% and palladium has plunged 31.8%. Gold added $1.50, or 0.1%, to $1,072.50 an ounce. Silver fell 25 cents, or 1.8%, to $13.92 an ounce. Platinum declined $21, or 2.5%, to $836 an ounce. Palladium fell $13, or 2.3%, to $543 an ounce. Compared to a week earlier, palladium edged up 0.2% while the other metal prices registered declines of 0.6% for gold, 1.5% for silver and 2.7% for platinum. The United States Mint limited American Silver Eagle sales this week to 1,075,000 coins. Distributors ordered 95% of them, the first week in five that some remained. Sales of the silver coins have been rationed for most of 2015 because of planchet shortages. Still, they hit a new record for a year which now stands at 45,870,000 coins. The record cannot climb too much higher. This was the Mint’s last week of producing 2015-dated Silver Eagles and the year’s final allocation amount will be announced on Monday. The Mint will begin selling 2016-dated Silver Eagles on Jan. 11. U.S. Mint gold sales also have limited room for advancement with three of four American Gold Eagle products sold out and replacements not available until Jan. 11. The least popular one-half ounce Gold Eagle is still available and 1,000 of them sold this week. None moved last week. In American Gold Buffalo coins, 500 sold this week compared to 3,000 last week. since the bullion value is at record lows you would think the coins sold by the mint and dealers during 2015 would have been much cheaper as well. Nope, not so. I totally agree with you! Many coin dealers do not lower prices on silver bullion coins they say because they are collected by many as graded/stabbed certified coins & some collectors are willing to pay a high premium for them. Crazy situation! The headline for this article should read “Silver Hits 6.3-Year Low & U.S. Mint Still Doesn’t Lower Its Silver Coin Prices!” Wishful thinking on my part.